The P50 is Shark’s interesting take on a cordless upright. 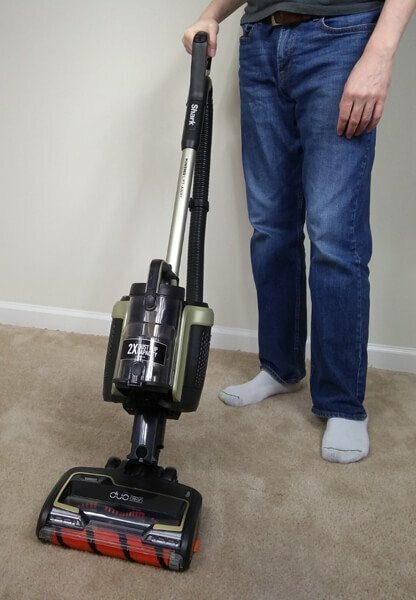 It’s bigger than a stick vacuum, looks like an upright, is cordless, and has the Lift-Away feature that adds incredible versatility. Once you’ve figured out how everything clicks together, you realize just how much freedom you have with this vacuum. In all performance tests, which you’ll see below, the P50 is just as impressive as we expected with the DuoClean cleaner head making short work of a variety of debris types on carpet and bare floors. This vacuum feels good. Detaching the handle, swapping to Lift-Away mode, removing the battery, and accessing the filter are all intuitive. Everything feels solid and satisfyingly clicks together. Upright, Lift-Away mode, or just using the wand gives you the ability to vacuum almost anywhere. In Lift-Away mode, the handle is much smaller than typical stick vacuums, such as the Dyson V10 or Shark F80, and that makes it ideal for vacuuming in tight areas such as vehicles. The soft DuoClean brush roll and soft wheels make it ideal for hardwood. Large dustbin capacity. 2x that of the Shark F80 stick vacuum. In Lift-Away mode, the handle is more lightweight than a typical stick vacuum since you simply hold the vacuum canister in your other hand. This creates less wrist strain. Vacuum settings are right at your fingertips on the handle. The soft brush roll on the front is removable, but the interior one cannot be removed. You need to flip over the cleaner head to clean the primary brush roll. The dustbin capacity is smaller than most full-size uprights. If you’re interested in learning more about all the other vacuum options available from Shark, then check out our Shark Vacuum Overview. Shark is responsible for some rather unique cordless and corded vacuum concepts. For example, the Shark Rocket stick vacuums look, at a glance, like they’re just another cordless stick vacuum. However, they’re a bulkier stick vacuum with a cord. You get the stick vacuum form factor, but the “infinite” vacuuming time from corded power. The Shark ION P50 is a cordless upright that combines some of the features we see in common stick, canister, and upright vacuums. 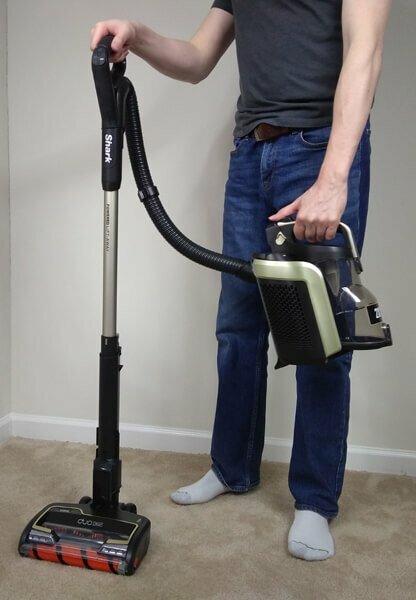 The portion of the vacuum that you’re pushing around on the floor while in Lift-Away mode is even lighter and more compact than a typical stick vacuum. 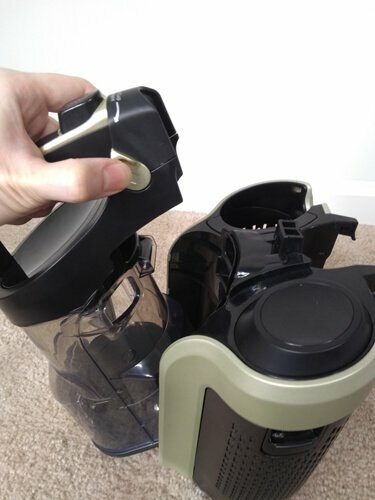 The detachable pod that houses the guts of the vacuum is a lighter and more compact version of what you typically see from a canister vacuum that rolls around on the floor behind you. Lastly, you can forgo these fancy features and use the P50 just like an upright, but without the cord. What Does “Powered Lift-Away” Mean? The Lift-Away feature has been around for years on Shark’s upright vacuums, but we haven’t seen it on a cordless vacuum, because cordless vacuums are generally only in the stick vacuum category. Here’s a quick look at how the Lift-Away feature works. On many of the older Shark uprights, the Lift-Away feature wasn’t capable of powering the cleaner head, so you were limited to non-powered attachments like a crevice tool or dusting tool. 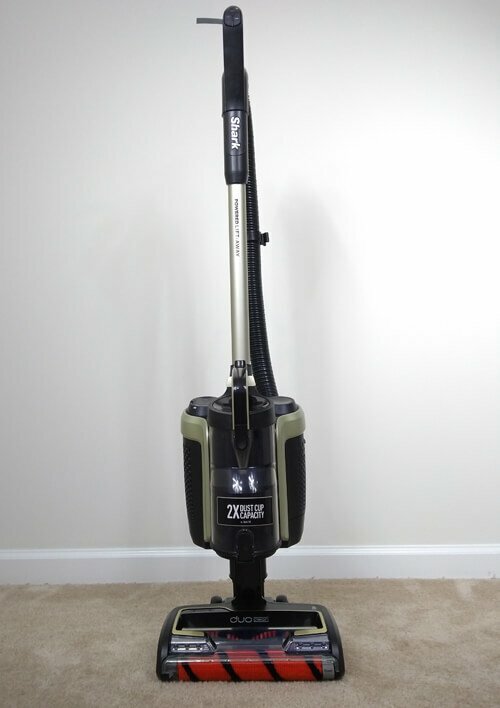 The Shark Rotator NV752 was the first popular vacuum that had the Powered Lift-Away feature where you could detach the canister and use the vacuum much like a traditional canister vacuum. Vacuuming stairs and under furniture is extremely easy as you would be hard-pressed to find a vacuum with a lower profile. We think the versatility afforded to the P50 by the Lift-Away feature makes it arguably an even better option than a stick vacuum when it comes to vacuuming in tight spaces or hard-to-reach areas above the floor. Below you can see exactly how the Shark P50 breaks down into its parts. The hose and handle attach to the Lift-Away pod at from there you can choose to use the vacuum cleaner head or one of the other attachments. 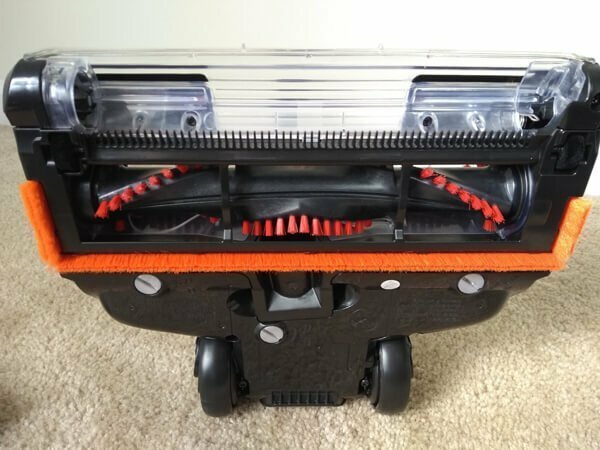 With stick vacuums, the trend these days is to make a handheld vacuum that houses the guts of the vacuum and then attach the wand and cleaner head to the end. 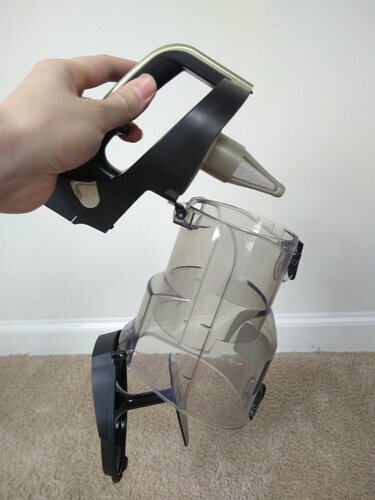 It makes sense and works well, however, for some people having the weight of the vacuum concentrated in their hand causes some wrist strain when vacuuming a large area. On that same note, one of the “controversial” features of the Dyson stick vacuums is the trigger. Holding a trigger for the entire duration of your vacuuming session is also strenuous for people with mobility problems. 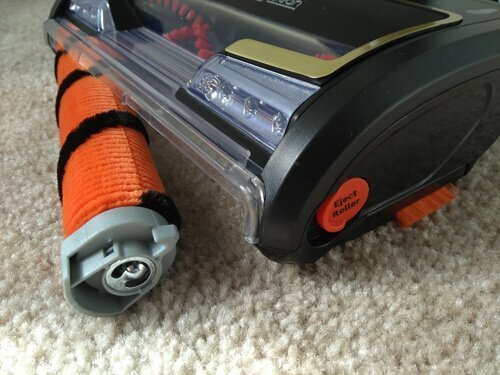 Shark’s stick vacuums don’t have a trigger and you just push a button with your thumb to turn it on or off. The P50 is just as easy with all of the controls right on the handle within reach of your fingers. Now, for most people, these cordless stick vacuums are a welcome improvement over the bulky full-size uprights they’re used to that often rely on being self-propelled to overcome their weight. However, we though it was worth mentioning since Shark’s P50 felt so much easier to use than even a lightweight cordless stick vacuum, like the Shark F80. The heaviest single piece of the vacuum is actually the cleaner head and it rests on the floor, of course. So you’re left with the handle, hose, and cleaner head in one hand and the Lift-Away pod in the other. There is no self-propelled function such as motorized wheels, but the brush rolls provide quite a bit of forward pull, especially so on thicker carpet. All this makes for an incredibly effortless vacuuming experience. 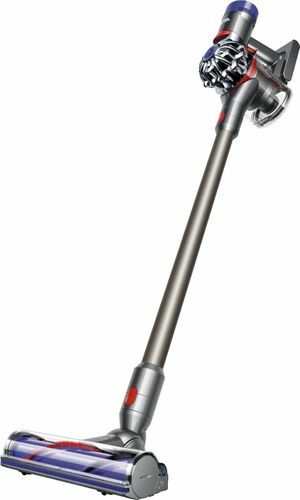 Now, another comparison we’d like to make is the P50’s handle compared to that of a cordless stick vacuum, such as the Shark F80 or Dyson V10. Which one would you rather vacuum your car with? Undeniably, the simple handle on the P50 makes for a much easier time vacuuming in tight areas such as vehicle floorboards or between seats. Not only that, but with the cordless canister you can get right to work without digging around for an extension cord or having trouble with the hose reach. The P50 has the largest dustbin among Shark’s cordless vacuums. From our experience, you likely won’t need to empty the dustbin before the battery runs out under normal circumstances. The same can’t be said for most cordless stick vacuums, but Dyson has a bit of a lead on dustbin size as their V10 has a slightly larger dustbin than even the Shark P50. Detaching the dustbin is easy and both ends open. This makes it very easy to clean up areas where large pieces of hair or fibers collect without digging around too much with your hands. The raised disc you see at the bottom ends up being a collection point for large debris to get wrapped around, so you’ll likely need to manually remove anything that gets stuck there as it won’t come out by itself. Battery life is the real pain point for most cordless vacuums. However, it has vastly improved over the years, and now we can confidently say that a cordless vacuum is capable of being the only vacuum you use. That’s especially true for homes with primarily hard flooring as it’s easier to clean. The P50 gets about 30 minutes of use with its single battery. You can purchase another battery separately. The numbers that you see below for the Shark ION F80 stick vacuum are for the combined time of both batteries, as it includes 2. As of the publication date of this review, the Shark F80 has the longest runtime of any cordless vacuum that we know of. Two batteries are better than one. The battery can be charged inside or outside the vacuum, but there is no separate dock to attach the battery to for charging. You simply plug the cord into it. 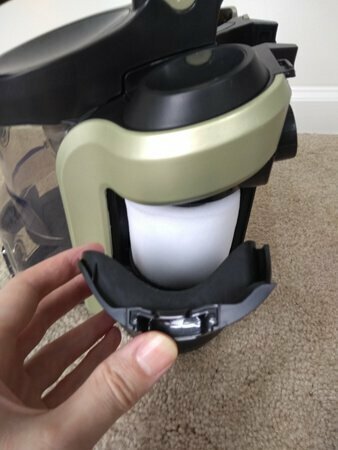 The design of the filter system is interesting since the vacuum’s exhaust actually passes through the battery before leaving the vacuum. It sounds strange but there is a HEPA filter along the side of the battery cavity. Those holes you see in the side of the battery and the side of the canister are where the vacuum’s exhaust passes through. The Shark ION P50 includes the popular DuoClean cleaner head that is now included in many of Shark’s latest vacuums. It combines the “paint-roller” style brush roll for hard floors and the common carpet brush roll that has sparse rows of bristles. The hard floor brush roll is a style that we’ve also seen included, often as a separate attachment, with other cordless stick vacuums such as the Dyson V6, V8, and V10. It gently brushes your hard floors and removes fine dust as well as pulls larger debris into the suction area instead of pushing it forward. Things such as dog food would often be too tall to even fit under the lip of the cleaner head on older vacuums. DuoClean helps remedy all these issues with getting, and keeping, debris within the suction area. The Shark P50’s version of the DuoClean cleaner head. Like all of the versions of the DuoClean cleaner head, with the P50 you can remove the front brush roll to give you more access for cleaning or clean the brush roll itself. Easily eject the soft brush roll for cleaning. In our vacuuming tests, we found that hair and other small debris was essentially completely removed from the hard floor brush roll. That’s because of the fine comb that constantly keeps the hard floor brush roll looking like new. Of course, if you ran into something that might stain you will need to remove the brush roll and wash it. Bottom of cleaner head with hard floor brush roll removed. 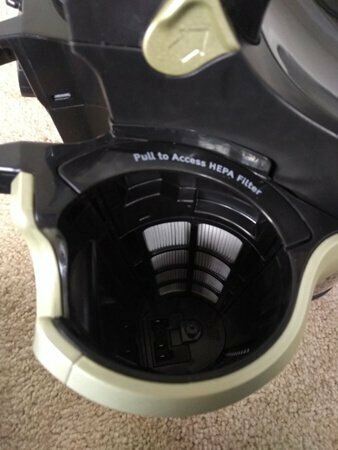 There are a few details about the underside of the DuoClean cleaner head that make it perform as well as it does. 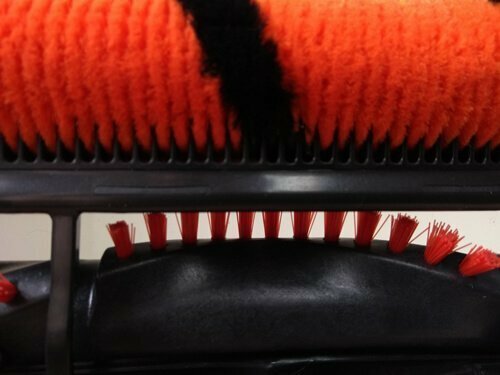 The row of bristles that surround the sides and rear of the suction area help prevent debris from getting thrown out the back of the cleaner head on hard floors. This has always been a common issue, and this is one of the design features that help solve the problem. Additionally, there are two vacuuming modes: one for hard floors and one for carpet. In hard floor mode, both brush rolls are slowed down, and power is shifted to increase suction. On carpet, both brush rolls run at full speed and help pull debris loose from carpet fibers. Here you can see how the comb helps fluff the brush roll and remove any debris that might get stuck in the fibers. This turns out to be very important after doing our floor tests and using the DuoClean brush roll for several weeks on our Shark ION 2x DuoClean model. More on that in the Cleaning & Maintenance section below. 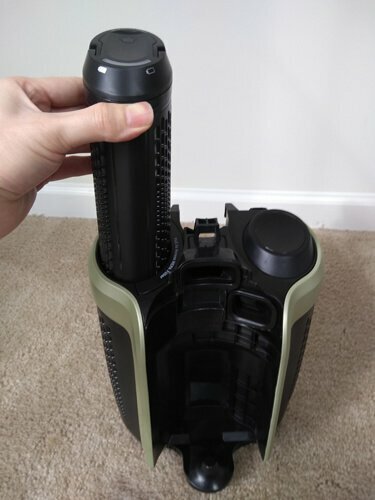 The Shark ION P50 is the only cordless vacuum from Shark that has their Anti-Allergen HEPA filtration, at least at the time this review was published. 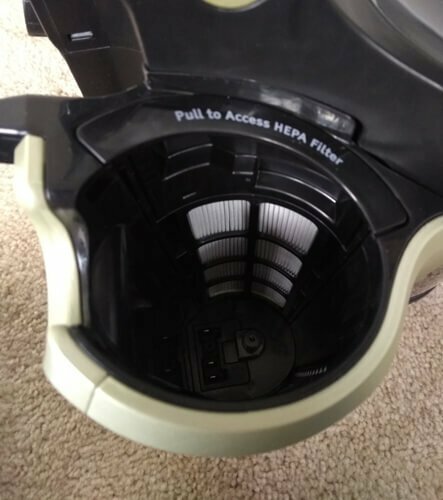 While we’ve been thoroughly impressed with how well the filters work on the Shark F80 and other cordless stick vacuums, it is nice to see them have a cordless option with HEPA filtration. This has been a weak spot for Shark cordless sticks for a while, as Dyson has had HEPA filtration on the V-series cordless sticks for a while. The P50 has a 2-filter system with a washable foam pre-motor filter and HEPA post-motor filter. It’s very easy to access and clean. How often should you clean the filters? The pre-motor filter should be cleaned at least monthly, and the HEPA filter should be cleaned once a year. Be sure to let the filters dry for 24 hours before putting them back in the vacuum. 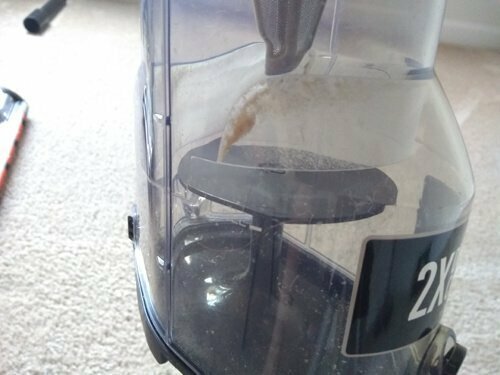 Letting moisture into the vacuum is a disaster, and you’ll never get the smell to go away, and it could potentially damage the vacuum. The problem areas, as with every vacuum, is the cleaner head and dustbin. The filters are easy to access and clean. However, the other parts of the vacuum take a little more effort. Shark did a great job in adding the comb for the hard floor brush roll, and we’ve found that it doesn’t collect hair or debris and remains clean after weeks of use. The standard carpet brush roll collects hair fibers just like any other vacuum. Shark did make it very easy to access and clean as well with the removable panel on the bottom of the cleaner head. The dustbin for the P50 is a bit odd. It’s not clear what the disc in the middle of the dustbin is for, but we guess that it helps keep debris that falls below from flying back up toward the metal mesh filter and restricting air flow. Hair and fibers do tend to get wrapped around the column below the disc, so you may need to pull it out manually if shaking it isn’t enough. 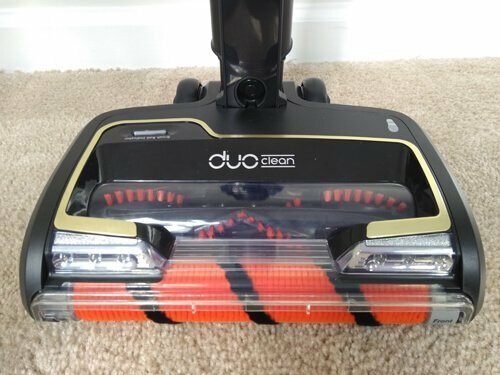 We’ve come to expect excellent performance and ease-of-use from the DuoClean cleaner head on carpet and hard flooring. The Shark P50 does an excellent job with all the tests, except for the fine debris test. We don’t think it’s necessarily a weakness with the P50, but rather it’s a difficult task for any vacuum. Read the details below. The Boost Mode button behaves differently depending on whether or not you have the cleaner head attached. 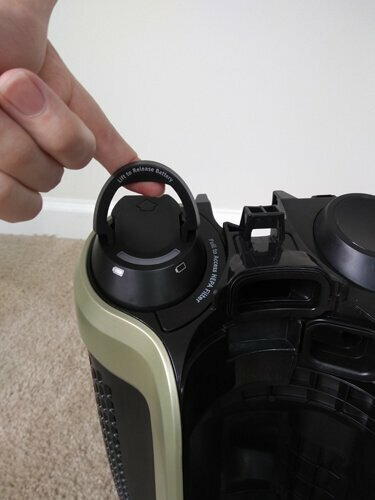 With the cleaner head attached, Boost Mode is activated by holding down a button on the handle while you vacuum. By making you hold the button down, you only use it when you need to, and this helps conserve battery power. This isn’t quite like the Dyson cordless sticks where you have to hold a trigger to power on the vacuum at all. Boost Mode helped pull out debris from tile grout, and the difference was noticeable. However, if you detach the handle, the vacuum automatically switches to Boost Mode to give you more suction. You can then deactivate Boost Mode by pushing the button, and there’s no need to hold it down to turn it back on. 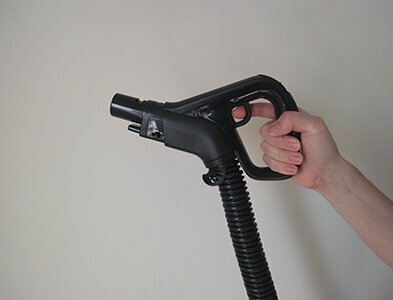 Since the cleaner head isn’t attached, the additional power gives you more suction when you’re just using the handle to vacuum furniture or your vehicle. This is a clever feature that makes sense. For our carpet tests, we used rolled oats, sugar, and peanuts to see how the P50 performs on a variety of debris sizes. The rolled oats are a tough test on carpet as their rough texture causes them to cling to carpet fibers and require a good amount of suction and agitation to break them loose. This test went very well, and the P50 picked up 99% of the oats by weight. In our second test, we used 10 grams of sugar. This test didn’t have a good result, and after inspecting the testing area closely, we could see much of the sugar had made its way down to the base of the carpet fibers, which is about half an inch below the top of the carpet fibers. We tested the P50 and the Shark ION 2x DuoClean to see if either of them could pick up the sugar while in Boost mode, but no noticeable amount was recovered. Finally, we also used one of our full-size, corded Panasonic upright vacuums to see if it could pull out the sugar. It also failed. Vacuums have a difficult time reaching that far down into carpet to pull out very fine, but relatively heavy debris. Light fine debris, such as dust, is more readily picked up by a vacuum’s suction, whereas sugar granules or sand will fall deep down into the carpet and isn’t easily recovered. A carpet cleaning machine that uses water is a possible solution to this problem. Large debris around the size of dog food can sometimes get pushed around by the front of the cleaner head instead of getting pulled into the suction area. As you can see, that isn’t a problem with the DuoClean system. The front brush roll works as intended and pulls larger debris into the vacuum, and this results in a nearly perfect single pass on the peanuts. The soft brush roll in the front of the cleaner head does most of the work on hard floors. It gently brushes fine dust from the floor surface and pulls in large debris into the suction channel without pushing the debris around. Switching to Hard Floor Mode increases the suction power and reduces the rotation speed of the brush rolls. Those changes made a big difference in our tests, and the P50 was able to remove all debris from the tile grout with ease. The sugar was easily picked up in the crevices between the tiles and Boost Mode wasn’t necessary. For the clip you see below, we weren’t using Boost Mode and only had the vacuum in Hard Floor Mode. There was no trouble picking up the oats within the grout lines. We also performed this same test with the vacuum in Carpet Mode and had trouble getting the oats within the grout crevice, so the additional suction from Hard Floor Mode makes a difference. We did not do an airflow test to confirm whether or not the suction increases when switching between Carpet and Hard Floor Modes, but it seems to audibly change and covering the intake with your hand does result in a feeling of more suction. This test was another 100% pass. We didn’t include the clip here for the sake of brevity, but the Shark ION P50 was able to pick up the peanuts just as well as the other Shark ION stick vacuums that we’ve reviews. 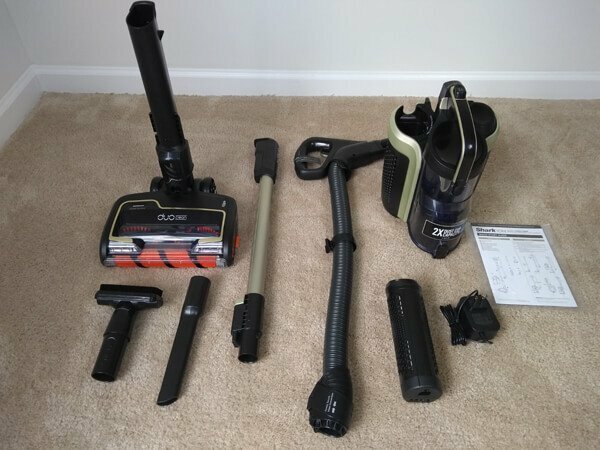 This test is something that a lot of older vacuums struggle with, but it’s completely trivial with the DuoClean cleaner head regardless of the vacuum being a full-size corded upright or lightweight cordless stick vacuum. Dyson is Shark’s major competitor when it comes to cordless vacuums. The Dyson V10 has some impressive stats but lacks some of the conveniences that come from Shark’s DuoClean, Lift-Away, and removable battery technologies. Dyson gets a lot of things right with their V10 cordless, but our opinion is that the non-removable battery is holding it back. The Shark P50 only comes with a single battery, but you can buy an additional one separately. 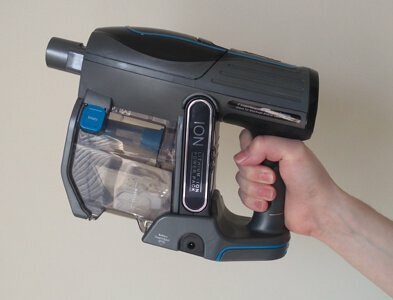 At the time this review was published you could buy the additional ION battery with the Shark P50 and still pay nearly $100 less than the Dyson V10. That would result in an hour of vacuuming time on carpet or floors.